My daughter and I were singing Rudolph all morning long! While eating breakfast, while driving to school. I'm a little scared and also excited that come Friday, I'll have her home for two and a half weeks of winter break! Now... ask me at the end of the two and a half weeks to see if I still feel the same about that. The holidays are always a fun time, especially when you've got little ones running around with all of their excitement. There is something to be said about homemade gifts, and I've always said that. They mean the most to me and always have. I would much rather have something that I know someone spent the time, effort, and thought into... than anything else! To know that you were in someone's special thoughts is a gift in itself. Finding the time for those homemade gifts can be the challenge. For me, food is a way to the heart, so naturally my gift giving idea is just that! This Homemade Hot Cocoa Mix and these adorable Sugar Cookie Spoons are perfectly quick and easy to prepare with just a handful of ingredients. Literally 5! For the cookie spoons I went with Pillsbury, one of my most trusted brands, to save me time with their wonderful Sugar Cookie dough. I love that it's easy to work with and gives me that perfect bite of sugar cookie that I know and love. Pillsbury is nostalgic for me, and brings back a lot of memories of growing up and my mom too! She did (and still does) buy the seasonal Pillsbury Shape cookies with all of the fun designs on them. Yum! I also lightened up the cocoa mix by using a reduced fat powdered milk and a lot less sugar! By a lot less, I mean half as much sugar. Trust me though, it's still perfectly sweet, creamy, and decadent! This Homemade Hot Cocoa Mix & Cookie Spoons would make for an amazing way to give a homemade gift to friends and family. It's easy to whip up both of these to pair together. After all, what goes better with hot chocolate than cookies? Place about 1 tbsp. of the cookie dough into each section of the silicone spoon mold; spread out evenly among the cookie shape of the mold. Transfer the mold(s) to the oven to bake for about 10 minutes or until the cookies are done. While the cookies are cooling, mix together the 2 C. Reduced Fat Powdered Milk, 1 C. Powdered Sugar, 1 C. Cocoa Powder, and 1/2 C. Natural Sweetener together in a medium mixing bowl. Distribute the mix however you would like if gifting, otherwise store in an airtight container until ready to use. Once the cookies are cooled, remove from the mold and repeat for the remaining dough. To make the hot cocoa add about 2 Tbsp. of the cocoa mix to 1 C. hot water. 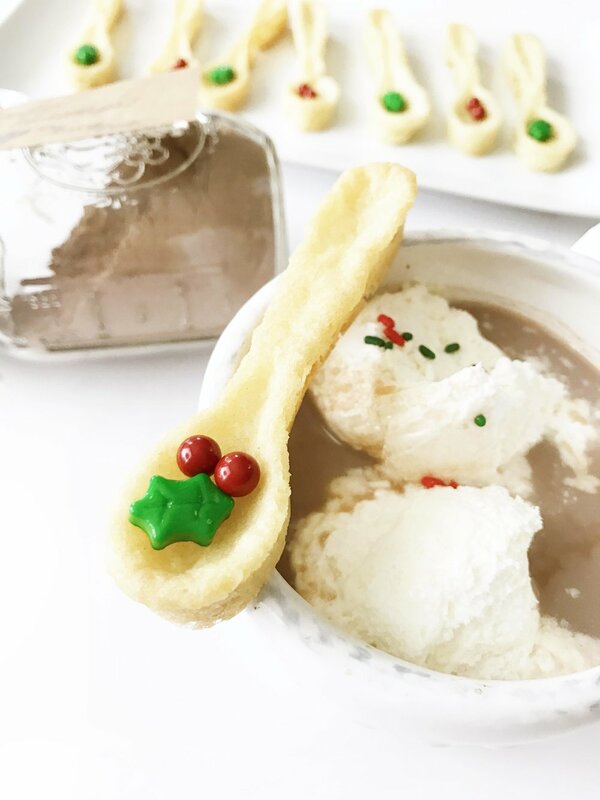 Serve the hot chocolate with your sugar cookie spoons and enjoy! This has been compensated by Acorn Influence and Pillsbury advertiser. All opinions are mine alone.